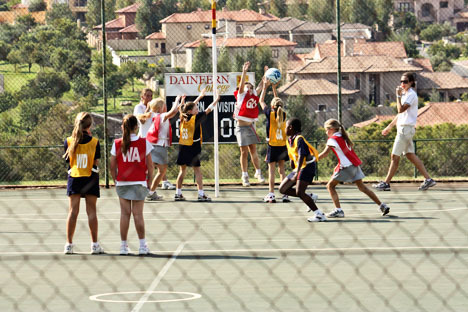 Guest Post: What is Netball? In a first for Joburg Expat, today’s feature is a guest post. I was cleaning up my hard drive when I came across some files I didn’t recognize. Curious, I started reading, and it turns out that Sunshine must have been busy writing her stories, as she is prone to do. I can always tell by the colorful fonts when it was her. I thought this would make for a nice little guest post, since she has been asking to write one for a while. Plus it will give you something to read while I sort through our Botswana pictures, which might take years for all I know. I almost miss the days when film was expensive and you thought twice before pressing that shutter button. These days I sit there in agony not knowing whether to keep the picture of the elephant with the trunk up or the trunk down or perhaps rather the one with the trunk slightly in between up and down. And don’t even get me started on the three hundred leopard pictures. Well, a net is something provided for a ball to go through. And a ball is what goes through the net. So my point is that the whole objective of the game is to get the ball trough the net as many times as possible. I for one play netball myself and it is a wonderful sport to play. It does get tiring after a little while but if you love it that much you just have to keep playing. I play center and get tired every five minutes because I am running around the whole court like crazy, and can I just say netball courts are quite big. But you just have to learn that no ball will come to you if you are floating around like a lost fart.